Details: Window trim work and crowns; stick and shingle work in south elevation gable. Significance: Fine example of a two-story frame clapboard structure of the period has pitched roof with slightly flared eaves and a pedimented gable containing two different textures of shingles and a pair of multilight attic windows, front of the second floor is shingled and has a pair of windows, their upper sash with diagonal lights, roof fragments slide down each side of that floor and join one another across the front before meeting the low-pitched roof over the projecting porch. The outer end of the porch's roof breaks to form a low pediment on each side face. Three thin columns support the porch lintel and are connected by widely spaced balusters. The porch (a 1930 reconstruction, using older pieces?) shelters a fixed-pane, transom window and an entrance next to a small, square multi-light window immediately above the porch's access stairs are located. 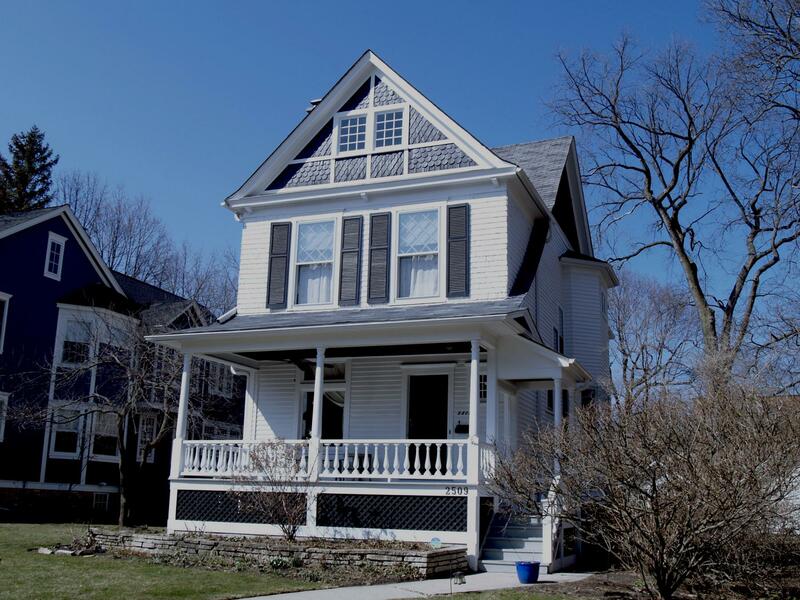 Historic Features: Gables with shingling and stick work, side gable roof extensions to the front porch, diamond panes upper window sashes; two story Gable-Ell on east elevation, chimney stack on west elevation. 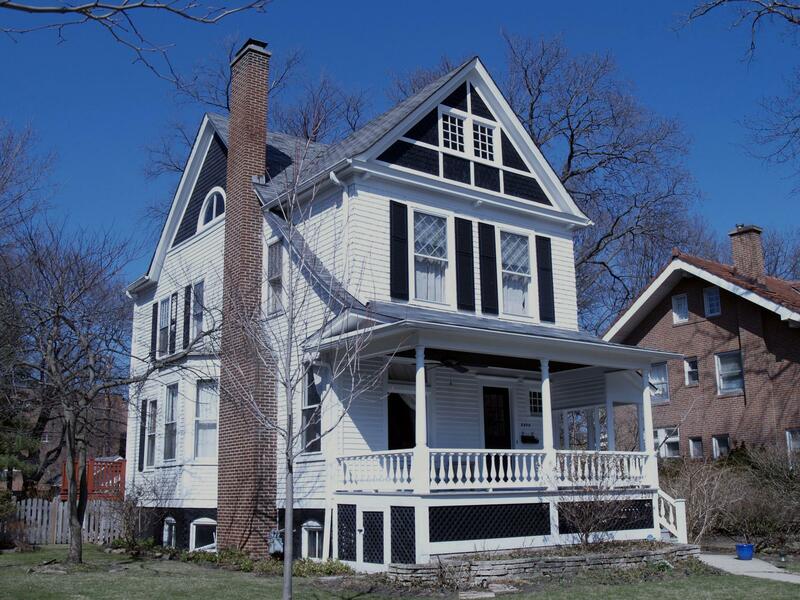 Alterations: Porch balusters and railing may be replacements. 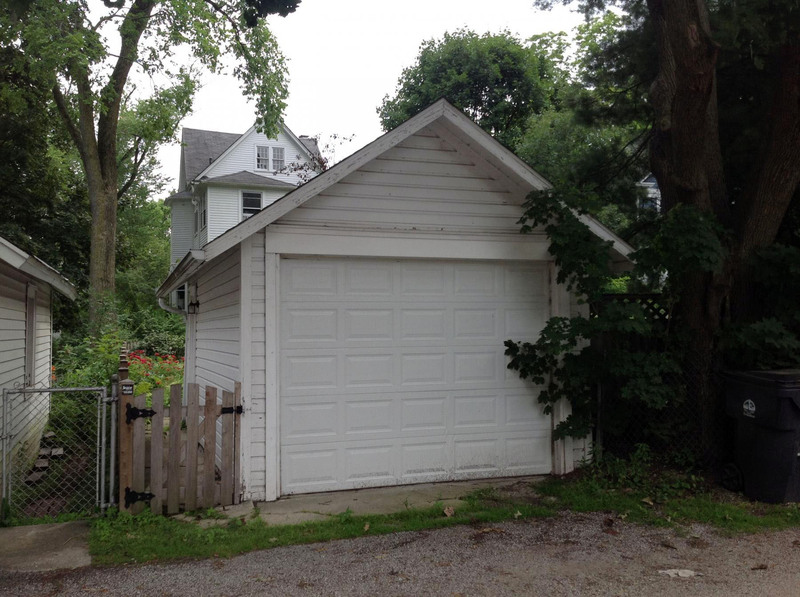 Other Permit Information: 1924.17, BP #12273 for a 1-sty frame garage, size: 12'W x 20'L x 15'H, cost: $125, OWN: F. S. Bund; 1926.14.10, BP #15816 for a 2-sty frame rear por enclosure, cost: $500, OWN F. S. Bund; 1930.04.04, BP #19618 for a 2-sty new open front por and enclosed rear por, cost: $2,000. COA Info: 13PRES-0035: Replace existing fence on N sides (at back of house) and E side of back yard, the new fence is wd arched picket (4' H x 124 L on all sides); 05HIS0000000156: Install wd fence 6'' x 34'' on the rear property line along the alley; 02HIS0000000163: Interior renovation of rear of residence, including the add of new wins in the rear stair and on the side of house, the conversion of an existing window to a doorway and the construction of a new deck and stairs to the backyard; 01HIS0000000047: Replacing east boundary picket fence in kind, 4.5 feet high.